We often proudly point out that sailing is different because there is no other sport where we can compete on an equal footing with the best in the world, both professional and amateur. As much as I would like to, and if he would spot me the 16 strokes due to my handicap, I have no opportunity for a golf match with 2017 PGA Player of the Year Justin Thomas! US Sailing’s Championship of Champions for the Jack Brown Trophy, honoring a man who was notable for service as a judge, regatta organizer and member of US Sailing committees, is a great example of how “good” sailors get to sail against the best. Each skipper in this annual invitational event must qualify by winning a one-design class National, North American, or World Championship. 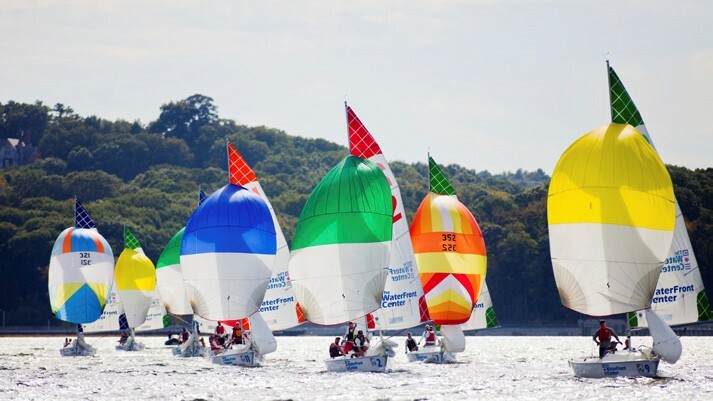 First held in 1976, the C of C is sailed in a different class each year, from Snipes, Thistles, Flying Scots and Lightnings to Sunfish, Hobie Cats, Y-Flyers, C-Scows, J/24s, Etchells and VX Ones. In addition to the invited skippers (none of whom may be a champ in that year’s selected class), US Sailing invites a mystery “guest skipper.” This year it was Steve Benjamin of Miami, FL. As US Sailing’s 2015 Rolex Yachtsman of the Year (and a strong contender for the honor in 2017), he is indeed one of the best. The 2017 C of C was hosted by The WaterFront Center in Oyster Bay, NY October 6-8, and sailed in that community sailing organization’s Sonar fleet. Each of the 13 boats were painstakingly equalized in terms of rig tune and other variables by US Sailing’s Adult Program Director Betsy Alison and her organizing team from US Sailing and The WaterFront Center staff. Principal Race Officer Mark Foster and his team got in all 13 scheduled races in a two-throwout, round robin format in conditions that ranged from five to 25 knots. Fresh from a big win at the Etchells World Championship in San Francisco the week before, Benjamin, sailing the C of C with Chris Larson, (Annapolis, MD) and Phil Trinter (South Bend, IN), won by just five points over Lido 15 National Champ Chris Raab (Newport Beach, CA), with the father/son team of Rob and Peter Kinney as crew. Raab was trailed by three points by last year’s C of C winner, Paul-Jon Patin (Forest Hills, NY), representing the JY15 Class and sailing with Peter Beardsley (Larchmont, NY) and Steve Shepstone (Watertown, CT). Just three points off the podium in fourth place was 2017 J/22 World Champion Mike Marshall (Jamestown, RI). Other skippers hailing from the Northeast included Interclub Champ Ted Ferrarone (Larchmont, NY; 9th) and Comet Champ Talbott Ingram (Ocean Township, NJ; 11th). For Benj, as he is known worldwide, this was a very special win. He grew up in Oyster Bay, and this was his first Championship of Champions. We sat down at his house in Norwalk, CT to talk about his approach to an event that is so different to his typical campaigns. WindCheck: This event is quite different than a multi-year Etchells or TP52 campaign. How did you approach it? Steve Benjamin: Well, when Jack [Gierhart, US Sailing’s Executive Director] invited me as this year’s “mystery skipper,” I was really grateful and excited to be coming home to Oyster Bay to sail! I had not sailed Sonars for a very long time, so I started finding out all I could, especially what weight the boats were supposed to be sailed at. WC: Was weight the number one priority on your list for crew? SB: Obviously skill level but yes, weight is a huge factor, especially in keelboats, which I think a lot of people underestimate. When I found out we were sailing with three in a boat that typically races with 700 pounds of crew weight or more, then “biggest and best” defined my search. I’ve sailed a lot with Chris (Larson) as tactician and we had recently won the Atlantic Nationals in August. Chris is a pretty big guy, which was good. But for biggest and best, Phil (Trinter) was a no brainer. WC: How do you handle being up to weight in the Etchells? You sail with four, correct? SB: Yes. Four is way better, I think. We use a 157-pound target and it makes it pretty easy for people of that size to not fluctuate too much. We usually come in about five pounds under the limit, which is perfect. And I really value the extra set of eyes on the boat, more so even than the extra set of hands. WC: Had you three sailed as a team before the C of C? SB: No, we had not and that brings up the “chemistry” factor. Honestly, things were a little bumpy at times! But this was a short event and we made it work. In the Etchells, it’s a huge factor. When you’re spending 100 days a year with a group, chemistry becomes paramount. WC: What did you think of the Sonars and the format? SB: Betsy and her team did a really good job of trying to make them even, and it really brought me back to a college sailing mentality! [Benj was Collegiate Sailor of the Year, 1978, Yale] You have to understand that the boats will never be identical in an event like this. The sails may have different wear and tear, the rigs ever so slightly different, so you really need to jump in and start tuning up your boat right away. There was not a lot of time between races so when we would get on our next boat, we immediately went to our respective “ends” of the boat and started the checklist. WC: I noticed that you would go straight for the tiller head. SB: Ha! Yes. These Sonars did not have straps on the head of the tiller to hold them down, so you could easily have a disaster if the tiller went straight up during a maneuver. In our kit were two wrenches and I would tighten the tiller head, check that the bailers were closed, examine the hiking stick universal, etc. Chris and Phil each had their items to check, then we would get sailing as quickly as possible. After a spinnaker snafu in one of the early races, we pulled the spinnaker up before each start. WC: A lot of the teams were relative “unknowns” in that you probably had not raced against many of them before. Did that affect your strategy? SB: That’s true. 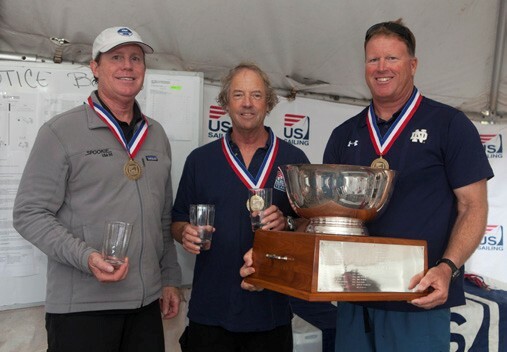 I certainly have raced against a lot of the dinghy sailors in Interclubs, like Ted Ferrarone, who bested me to win this year’s IC National Champs, or Paul-Jon Patin and guys like Chris Raab and Neal Fowler, who are contemporaries of mine and have really impressive resumés. But there are so many talented sailors across one-design sailing that we did not take anyone for granted. WC: So you were impressed by the fleet? SB: Absolutely! Just look at the scores. Eight different teams won races and everybody had two races that they were very happy to throw out! We chucked a ninth and an eighth and still had to keep a seventh. SB: Here is where Chris really excels. He would take the scores after every race, and he knew who was winning throughout the event. While I just prefer to try and sail solidly every race, Chris was very focused on keeping tabs on whoever was doing well and he never let us get too far from them to manage risk. And again, if you look at the scores, those teams changed throughout the regatta. WC: Thanks Benj, and good luck this winter! 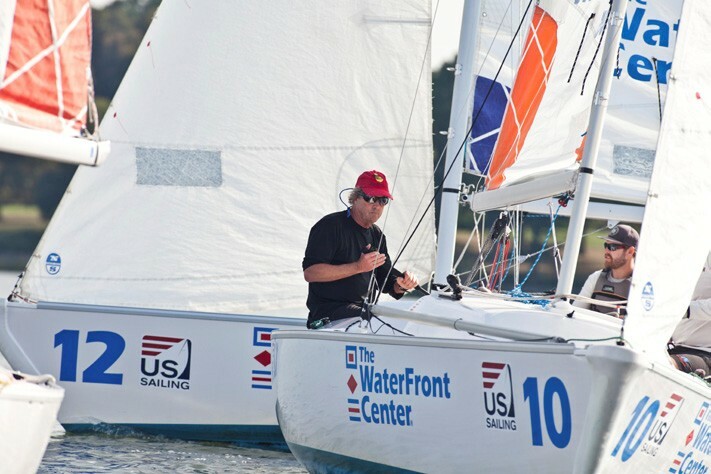 Ben Cesare is a member of the International Lightning Class as a crew, and sailed in the C of C with 2016 Lightning North American Champions Todd Wake (skipper) and Neal Fowler. Todd and Neal came within the last beat of winning the 2017 Lightning NAs with Todd’s wife Kristine as their third in August in Wrightsville Beach, NC. Cesare was chosen for his Sonar experience, his weight, and his taste in beer, which matched Todd and Neal’s (chemistry).